We've had a very quiet half term break, as Joseph has been poorly with the worst cold imaginable, or so he tells me. Man flu appears to start very young. He's spent a lot of time playing power rangers, doing jigsaw puzzles and playing with my tablet computer. Yesterday I managed to persuade him to try a walk to the playground. 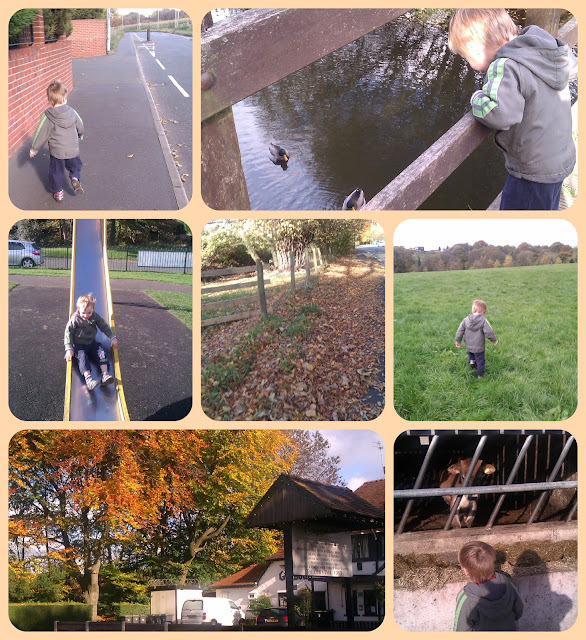 We ended up spending 3 hours at our local country park playing with dogs, feeding ducks and having a wonderful time. It was so lovely just to get out and about, just the two of us. After everything that's been going on it was just so lovely to connect with him outside. We are very blessed to have this lovely place to go to right at the end of the street! Did you know I also have a Facebook page which is a great place to connect, not only with me but other parents who have had a premature or sick baby. I would love to see you all there, and see your photos and stories too. Ah Burrs is lovely, our cub pack have stayed in the buildings there. They always really enjoy it and not too far from us at all.